The Institute has always sought bold new ways to use the laws of nature to rapidly expand mankind’s space capabilities. We have always advocated using material already in space for the construction of structures such as space habitats, solar power satellites, large radio telescopes etc. Initially, these ideas were met with skepticism from people who were unwilling to set aside their terrestrial prejudices and realize the true factors involved in space operations. Once this basic prejudice is overcome, tremendous advances can be demonstrated. Brandt Goldsworthy, a member of the Institute’s Board of Trustees, has pointed out to us that we are also hindered by another terrestrial prejudice. 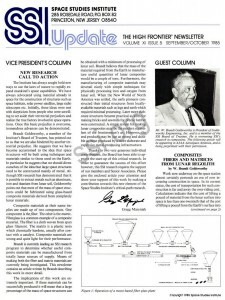 He suggests that we have become accustomed to the idea that space structures will be built using techniques and materials similar to those used on the Earth. In particular he suggests that we should divest ourselves of the idea that large space structures need to be constructed mainly of metal. Although SSI research has demonstrated that it is possible to extract metals such as aluminum, iron and titanium from lunar soil, Goldsworthy points out that most of the mass of space structures could be fabricated using glass-based composite materials derived from completely lunar materials. Composite materials as their name implies are made up of two components. One component is the fiber. The other is the matrix. Fiberglass is a common example of a composite material. The fiber is a cloth woven from spun glass filament. The matrix is a plastic resin which chemically hardens, usually after contact with a catalyst. Composite materials are strong and quite light for their performance. Brandt is currently leading an SSI research program to determine whether useful composite materials can be manufactured from totally lunar sources of supply. Means of making both the fiber and matrix materials are currently being investigated. 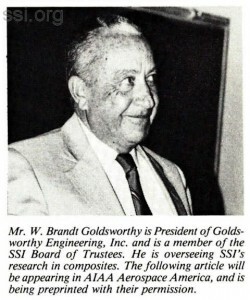 This newsletter contains an article written by Brandt describing this work in more detail. The implications of this work are extremely important. If these materials can be successfully produced it will mean that a large percentage of the mass of space structures can be obtained with a minimum of processing of lunar soil. Brandt believes that the mass of the material required from the Earth to manufacture useful quantities of lunar composites would be a couple of tons. Furthermore, the manufacturing of composite materials may dovetail nicely with simple techniques for physically processing iron and oxygen from lunar soil. When the New World of North America was settled, the early pioneers constructed their initial structures from locally­available materials such as logs and earth which required minimal processing. Later more elaborate structures became practical as kilns for making bricks and sawmills for precise lumber were constructed. A simple system for making lunar composites may be the modern equivalent of the frontiersman’s ax. However, the end products may be just as strong and durable as those produced by a more elaborate and expensive metal-processing infrastructure. Thanks to two very generous individual contributions, the Board has been able to approve the start-up of this critical research. In order to guarantee the success of this effort however, this SSI research requires the support of our members and Senior Associates. Please give the enclosed article your attention and show your support of this work by making a contribution towards this new element of the Space Studies lnstitute’s critical-path research. Work now underway on the space station almost certainly portends an era of ever increasing construction in space. In its current status, the cost of transportation for such construction is far and away the over-riding cost. Calculations indicate that the cost of lifting a pound of material from the lunar surface into space is less than one-twentieth that of the cost of lifting a pound from the Earth’s surface into space. On this premise, it would seem that the establishment of a lunar colony to mine and export materials of construction should be a goal of considerable immediacy. The primary reason lunar metals export is undesirable lies in basic economic principles; that is, given present and near-term future circumstances, lunar metals cannot be made to compete with Earth metals. 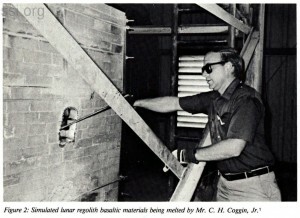 Studies such as those performed at the Jet Propulsion Laboratory(2) clearly point up the fact that the mass of effort that would be necessarily expended on production and power generating facilities to make a high grade alloy on the moon from lunar materials would result in those lunar alloys being economically non­competitive with equal-performance metals processed on Earth. The alternative, of using metals on the moon without alloying to improve strength properties, has the same effect of causing them to be non-competitive with highly developed alloys that we have on Earth. 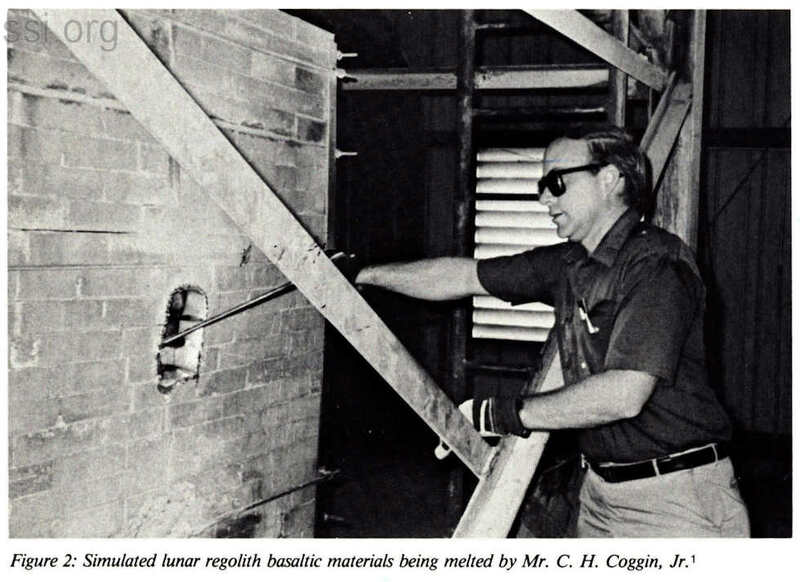 A detailed study of the composition of the regolith from the samples brought back on the various Apollo missions indicates that all of the raw materials required to produce both the reinforcement fibers and the matrix materials are available. Since neither matrix nor reinforcing fibers require any high degree of refinement, and both can be processed in extremely small facilities, the negative economics that apply to metals do not carry over to composites. Under these conditions, it is probable that all the materials of construction, both for the establishment of the lunar colony and for ultimate export, would be better produced by building upon a composites base as opposed to a traditional metallic materials base. One of the prime advantages is that the raw material for both fiber and matrix manufacture are available at all sites visited during the Apollo series. This is further enhanced by the fact that both mining and refining methods can be relatively crude and simple during the phase of producing materials for the establishment of the habitat and basic structures of the colony. At a later date, these facilities can be upgraded to produce a refined product with the properties required for export. A glass reinforcing fiber easily the equivalent of anything produced on Earth can be derived using feldspar as the principal ore. Apollo missions to the Highlands have shown that feldspar is present in surface materials as well as in outcroppings. As export became of primary interest, it would probably be more feasible to mine the subsurface veins rather than separate the feldspar float from subsurface materials. Feldspar is one of the most important sources of alumina. The mineral can be obtained in a reasonably constant condition and in a state of sufficient purity as to the freedom from iron and other objectionable elements. The other accompanying oxides are also useful in glass. It usually melts between 1100-1200°C and dissolves readily in the melting batch in the process of glassmaking. Although the production of fibers for reinforcement appears to be relatively straight­forward, the creation of matrix materials is considerably more challenging. On Earth, the matrix materials used in composites are normally organic in nature, with the exception of the metal matrix composites. There being no organics on the lunar surface, the obvious task is to explore the possibility of an inorganic matrix material. As we were already concentrating on glass for the reinforcement fibers, it seemed that glass or ceramic as a matrix would require less basic development if they were usable. Using porcelain enamel technology as a baseline, we explored the availability of elements that would reduce the melting point of the glass. As these appear to be present, the indicated path is towards the generation of techniques for making a glass/glass composite. Glasses used in the manufacture of reinforcing fibers have a melt point approximately in the 980°C area; the effort here is therefore toward the formulation of frit-like materials having a melting point in the 315° to 375°C range. If this objective proves feasible, the result would be a composite that would be processed in much the same fashion as the very high melt advanced polymer composites currently being used in the airframe/aerospace industry. It appears possible that the conversion of a glass/glass prepeg to end product may be simpler than in thermoplastic polymer/glass systems. Although both require a simple melt­chill processing, the glass matrix should not be subject to the sublimation, oxidation degradation, and chain breakdown problems encountered in polymer heat cycles. Energy sources and processing techniques for producing glass fibers have been the subject of previous studies. (4) It is believed that simpler process technology can be developed in light of investigations being undertaken to see if composite material production could be a continuous process tied to the oxygen production process. Initially it would be desirable if all of the energy for processing both the fiber and matrix materials could be obtained from solar concentrators, and this may be possible. At some later date it might be worthwhile to use a combination of solar concentrators and electricity in order to better control the temperature of the platinum fiber bushings. In the manufacture of glass fiber on Earth, the single factor that causes the most manufacturing difficulties is the sloughing, or solution of the refractory materials from which the melt tanks are built into the glass melt itself. These impurities are the primary cause of fiber breakout during the pulling of the fiber, as well as a number of other production problems. 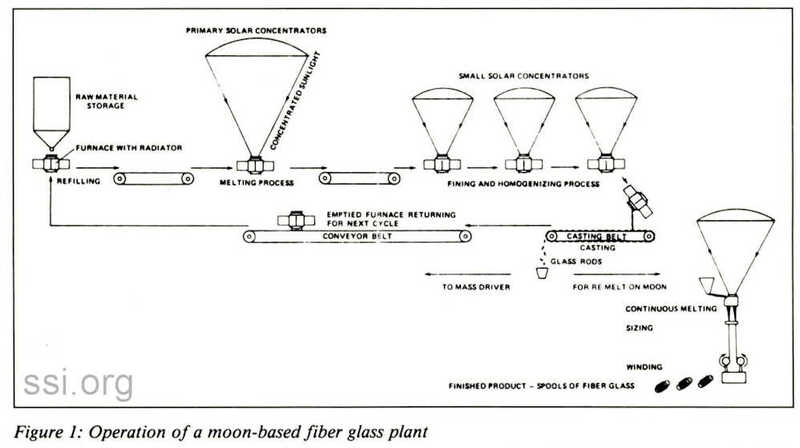 An intriguing possibility in the manufacture of glass fiber, both on the lunar surface and in space, is the potential for eliminating these problems and achieving super­pure glass by obviating the need for the refractory container. It is conceivable that in space the melt could be achieved without the need for any constraining vessel, which could lead to production rates and fiber properties not achievable on Earth. Even on the lunar surface there is the possibility that the basic melt could be used as the container, thereby obviating the possibility of contaminating the production melt. These are both areas that will be explored during the tenure of this study. As important as the ability to produce the fiber and the matrix is the method of combining them into a handleable form prior to their conversion into the final product. 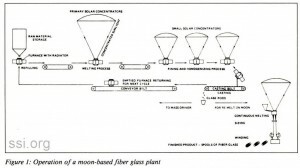 Analogous to the wet processing versus prepeg processing, the glass composite could be processed by either taking the basic fiber through the molten frit bath prior to forming into finished component, or the frit in powdered form could be deposited on the fiber in the proper volume fraction and sintered into a prepeg prior to introduction into the conversion process. This latter approach would seem to be more controllable, more universal, and have less potential for degrading the basic reinforcing fiber. The exact technique that will ultimately evolve will come about as studies of the manufacturing technology for the frit matrix point up the simplest productible form. As the vital task is the extraction of oxygen from lunar materials, it would obviously be very efficient if the production of fiber and matrix materials could be a continuation or an outfall of oxygen extraction. Both chemical and pyrolytic processes have been proposed for oxygen extraction, and the pyrolytic approach seems to be favored as it requires less support materials from Earth. Two such pyrolytic processes are illustrated in Figures 3 and 4. (5,6) The ability to tie the processes for making fibers and frit and that for extracting oxygen into a continuous operation is being thoroughly investigated, as the simplification potential and economic impact of this capability are obvious. However, if this is not possible, it certainly does not substanially diminish the advantages of composites as the basic structural materials. Other areas which will be part of the ongoing investigation are associated with the technologies required for converting the basic composite raw material into usable end products. As on Earth, this will probably entail a large number of diverse approaches, depending on the end product requirements, and calling for a case by case review. The two-phase approach mentioned earlier may also be applicable to end product conversion processing. Habitat construction and other simple structures could be produced by simple bending, forming, and welding techniques. As the requirement for more refined structures and increased physical properties in the final product evolved, processing methods would probably follow the generic machine processing currently practiced on Earth. These techniques would include compression molding, filament winding, pultrusion, tape placement, and other more sophisticated conversion techniques. Yet another downstream area for investigation is the determination of the form in which the composite raw materials should be transported to their ultimate space destination for conversion into structure or other products. The drivers that influence these decisions will undoubtedly be the timetable of the development of means of transport; i.e., mass driver, space tugs, etc. Our initial investigations have convinced us that the manufacture of composites on the lunar surface, from lunar surface materials, is perfectly feasible and, such being the case, that composites have tremendous economic and technical advantages over using traditional metallic materials for the same purposes. The real excitement that is developing as this study progresses is in the potential for dramatically collapsing the time frame for lunar colonization establishment. The ability to produce all the structural materials required for initial colonization from a simple light weight solar furnace could change the entire perspective of near-term lunar base requirements. 1. 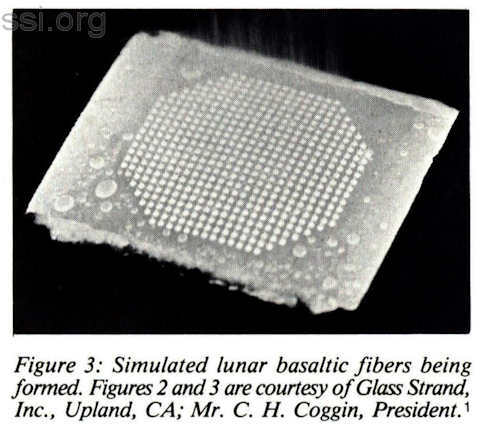 Cogin C.H., Jr., “Phase 1: Preliminary Report-Composites from Lunar Regolith.” Glass Strand, Inc., Upland, CA, July 1985. 2.Carroll, W. F., Frisbee, R. H., Steurer, W. H., and Jones, R. M., “Should We Make Products on the Moon?” Astronautics and Aeronautics, pp. 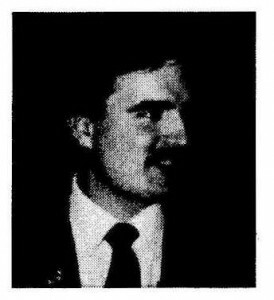 80-85, June 1983. 3. 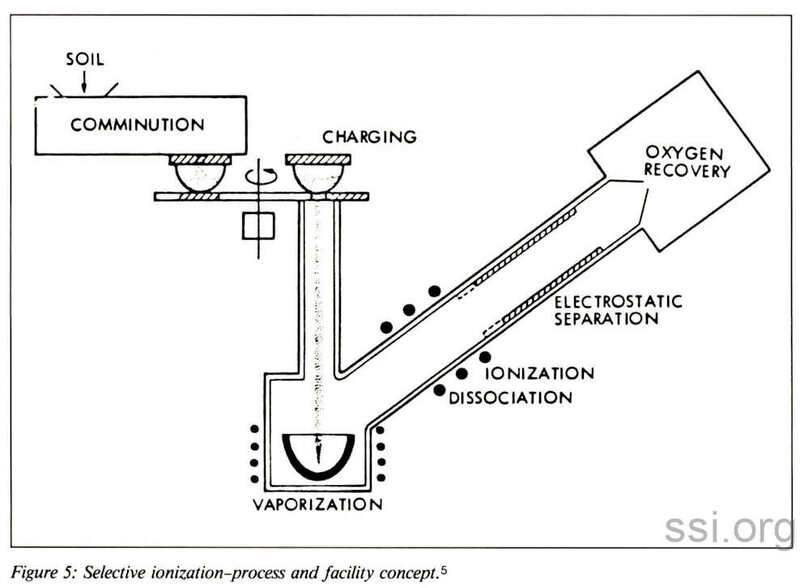 Subramanian, R. V., Wang, T. J. Y., and Austin, H.F., “Reinforcement of Polymers by Basalt Fibers,” SAMPE Quarterly, July 1977. 4. Ho, D. and Sobon, L. E., “Extra-terrestrial Fiberglass Production Using Solar Energy,” Space Resources and Space Settlements (NASA SP 428), pp. 225-227, 1979. 5. 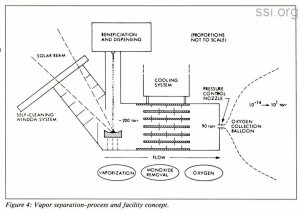 Steurer, W. H., “Production of Oxygen by Vapor Phase Pyrolysis,” NASA Summer Study, Technological Springboard to the 21st Century, La Jolla, CA, July 1984. 6. 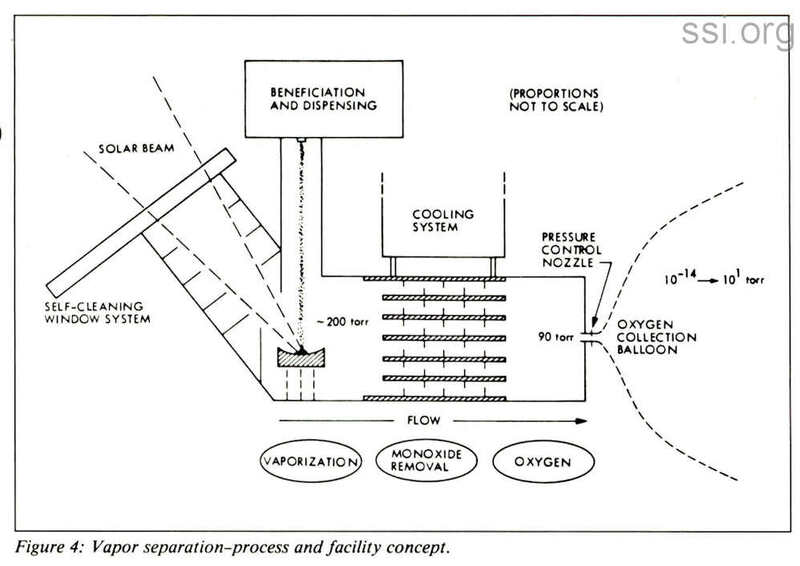 Steurer, W. H., “Production of Oxygen and Metals by Plasma Separation,” NASA Summer Study, Technological Springboard to the 21st Century, La Jolla, CA, July 1984. Think Big! We think of space. Developing space requires thinking big. Somewhat paradoxically, however, FINANCING space requires thinking small! 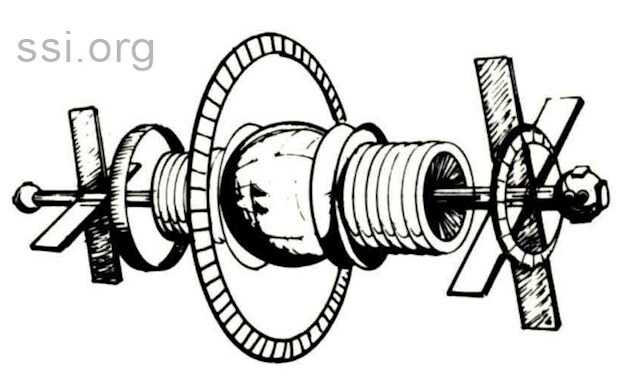 Success in financing means thinking of a space project as a chain of steps – with the size of each step no larger than can be “swallowed” by that mix of “Available Capital” and “Risk Aversion” we call the Supply of Money. The best way to appreciate the big small space finance paradox is to draw a graph. Stop reading this for a moment to get a pen or pencil and piece of paper. Got pen and paper? Good. Draw a straight vertical line about 3″ long. At the bottom of the line draw a horizontal line about 3″ to the right , thereby making a big letter “L.” Now label the vertical line of our graph’s axes (the “L”) “Available Capital.” Label the horizontal line “Risk Aversion.” Put little arrowheads at the ends of the “Available Capital” and the “Risk Aversion” lines. The arrowheads show that the attributes we are graphing increase in the upward and right direction, respectively. We can see from the Supply of Money curve that larger amounts of Available Capital (e.g. a tickmark far up the vertical axis) imply increased Risk Aversion (e.g. a tickmark corresponding to the point on the Supply of Money curve which intersects a perpendicular line drawn to the right from the Available Capital tick mark). This is the practical reality of financing – regardless of interest rates, the more money you need, the more conservative (Risk Averse) are your available sources. A quick example. Most start-up high tech ventures raise their initial financing from “private placements.” These are sales of large blocks of stock to “accredited investors” ­ persons who are demonstrably able to lose $100,000 or more. These accredited investors are about the least risk averse source of capital. As our graph would indicate, however, the Available Capital from that group is relatively very little – several million dollars per unique project, maximum. Again the paradox: the big thinking needed for “O’Neill Space” leads one to approach very high levels of Available Capital, but the graph shows this means project scrutiny under the strictest “Risk Aversion” mindset, a mindset that defines new resources as non-resources and thus denies the high frontier. The solution does not lie in storming Wall Street as the late 18th Century French radicals might recommend. Confusion invariably aids short-term speculators at the expense of long­term strategists (and is sometimes needed). Nor do laws which force people to do what they dislike (e.g. make loans) prove very cost­effective. The result is invariably more bureaucracy and a higher coefficient of socio­economic friction. The paradox is best resolved by breaking the big space project into a series of significantly smaller projects, each of which must be able to “stand on its own two feet” – that is, be an economically viable project without reference to future extensions of it. One must be extraordinarily creative and insightful about this “quantization process” – ensure one has not only thought out a logical chain of endeavors but hopefully has selected the “critical path” from among all the logical paths. The size of the initial project(s) must be commensurate with the amount of Risk A versiveness (in all its many manifestations) that you can reasonably expect to overcome. For most of us, a Getaway Special based project may be right on the margin of initial ambitiousness. Nothing combats Risk Aversion better than success. Thinking small in space financing makes success reasonably possible for the heartily motivated. With each success we reach further and broader. We begin networking together via that venerable human survival trait called community. And, as inevitably occurs, the once implausible becomes quite practical. Risks that once inspired fear and awe become the grist for reminiscence. The dream is proven possible along a pathway of success, and the necessary capital becomes available to develop our ultimate resource treasure chest. Published proceedings may be obtained for the Seventh Biennial SSI/AIAA/Princeton Con­ference on Space Manufacturing by sending your name, address, and check ($29.50 for AIAA or SSI members or $39.50 for non-members.) The proceedings “Space Manufacturing: Engineering with Lunar and Asteroidal Resources” will be published in hardcover format by the American Institute of Aeronautics and Astronautics. It will be a limited publication. You may order the proceedings by sending your name, address, request (please be sure to indicate volume number) and check to SSI. Please allow 6 weeks for delivery. The results of the study were produced by NASA and published by the Government Printing Office as NASA SP-413. This report consists of a 185 page volume – illustrated with a series of beautiful color paintings by Rich Guidice. In addition, there are numerous line drawings depicting various colony designs and space systems such as heavy-lift shuttle derivatives and flyback stages. This first major systems study on space colonies looked at many novel designs for elements of the lunar base, processing plants and space habitat. Some of these included a lunar gas gun for launching material from the Moon (a sort of nuclear-powered pea shooter! ), active mass catcher designs, an active method of sheilding colonies from cosmic rays and a doughnut or torus-shaped habitat which has come to be known as the Stanford Torus. One entire chapter is devoted to describing a visit to the colony, moon base and mass catcher by a person from Earth. Although many of the technical ideas depicted in this study were superceded by the 1977 NASA Summer Study (later published as NASA SP-428) and by research conducted by the Space Studies Institute, this volume makes interesting reading. It is required reading for anyone who wishes to get a sense of the history of the space colony concept. Steve Morgan gave a presentation before Florida Institute of Technology Aerospace Education Workshop on July 31. It was held on the Melbourne campus. He also organized and manned the SSI display €luring Spaceweek on Merritt Island. Between 200 and 300 people visited the display which featured slides, news­letters, brochures and meteorites loaned by SSI member, Hal Provenmire. Opportunities in computer-based communication in space including the Geostar Satellite System and orbiting supercomputers was the topic for Jim Bowery’s recent presentation to the UCSD AIAA Chapter. Jim has also organized an outting to the Mt. Laguna Lodge and Observatory with the Sierra Club, August 17-18. He will report on it in the next SSI Update. On Monday, July 22, on Fountain Square in the heart of downtown Cincinnati, Bob and Sharon Brodbeck set up their SSI display during the annual Space Day Commemoration. Jean Richardson, Ohio Local Support Team Member and Cincinnati L5 President, helped with set up and had coordinated the event which included the Cincinnati Planetarium and Cincinnati L5. The Midwest Space Development Conjerence will be held September 27-29 at Miami University in Oxford, Ohio. Bob Brodbeck will make a presentation at the Conference about SSI. If you are interested in obtaining more information, write to MSDC, Loran, Ohio 44053. Todd B. Hawley is a Distinguished Colleague of the Space Studies Institute, President ofthe SEDS Alumni Board, and Director of Special Projects for the Young Astronaut Council. SSI invited Todd to submit the following article. The Young Astronaut Program was created to use the excitement and marvels of the Space Program to encourage elementary and junior high school students to study science, mathematics and technology-related subjects. Today’s young people are being encouraged to meet the challenges and opportunities of the society of the future, and to learn about our past, present and future activities in outer space. Students in grades one through nine were targeted because those are the critical early years when many concepts and attitudes are shaped for life. The Young Astronaut concept is working. In its relatively short life, the Young Astronaut Program has fired the imagination of hundreds of thousands of youngsters and has been endorsed by educators, scientists, space-related organizations and major corporations. The original idea was conceived by the nationally syndicated columnist Jack Anderson. Anderson took the idea to President Reagan, who quickly agreed to the need for a Young Astronaut Program and set the private sector to support the Program as it had the Los Angeles Olympics. In a matter of weeks, a major national effort was formulated by NASA, the National Space Institute, and the White House Office of Private Sector Initiatives working with experts from government, industry and education. Pilot schools were selected from different areas of the country to test the curricular materials which are a significant part of the Young Astronaut Program. 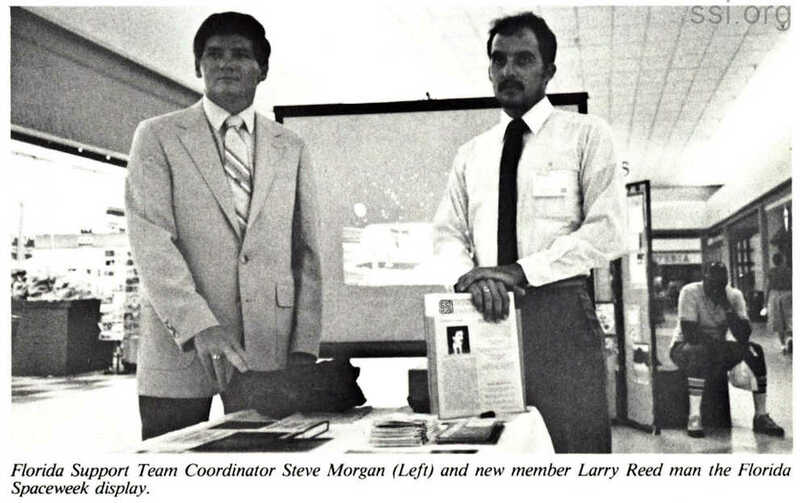 Members of the SSI Student Auxiliary SEDS (Students for the Exploration and Development of Space) served as volunteers for the Young Astronaut Council in the Program’s earliest days. 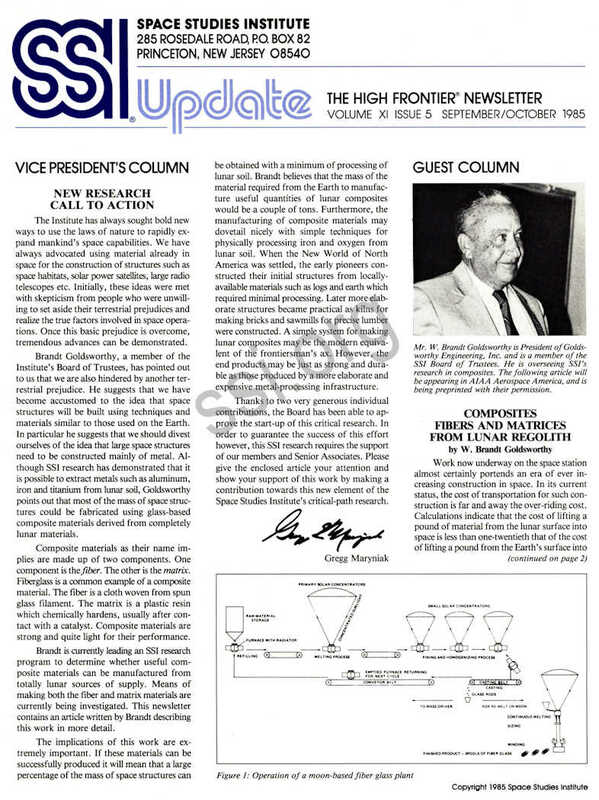 It was on October 17, 1984, that President Reagan officially launched the Program at the White House in the presence of hundreds of students and teachers representing the pilot schools, astronauts, and representatives from government educational institutions, space-related organizations and private industry. Only months later, the Program is experiencing phenomenal success, with thousands of Chapters in place. Each Chapter is headed by a teacher, usually a math or science teacher, or by a community leader, and consists of 5 to 30 youngsters ages 6 to 16. The Young Astronaut Council asked its Chapters to evaluate the Program at the end of the June 1985 term. The comments about the Program were overwhelmingly positive. One school in New Jersey said that the time spent of science was up 100% and up 85% on math. “Parents are excited and amazed at their children’s interest and independence at doing their own assignments”. Another in California reported that “Everything is so exciting! Outstanding material. I have increased time spent due to the excitement of my students”. We asked that they rate the Program on a scale of 1 to 5. The returns surpassed our most optimistic hopes. We even received some 5-plus evaluations. Clearly space is motivating students in a spectacular manner! Delivery to Chapters of educational materials by the Young Astronaut Program is accompanied not only through mailings of the space curriculum packages and activities which are provided to Chapters throughout the school year, but by Astronet, a computer-mailbox network, provided free to Chapters all across America by TYMNET. In a matter of seconds, updates on the latest NASA space shuttle mission, news on space exploration and supplements to the curriculum materials can be printed out for use in Chapter activities. The Program uses high-visibility media to reach out to the broadest youth population possible ­ including television programming and comic books. A new CBS Saturday morning animated TV series, “The Young Astronauts”, will be on the air starting Fall 1985. Set in outer space in the year 2015, the show will depart from traditional Saturday morning programming in that every effort is being made to be as scientifically accurate as possible. As realistic and non-fictional an approach as feasible is being used, including space-based mining and research scenarios. Use of exciting space habitation, construction and mining concepts that may be used in 30 years ­ some of them being researched by SSI ­ are included for authenticity. The Young Astronaut Program has attracted a stellar array of corporate sponsors. They include Commodore Computers, Marvel Comics, Pepsi, Safeway, Rockwell International, Martin Marietta, Tymnet, Group W. Coleco, Adidas, Xerox, Disney, McDonnell­Douglas and others. By building a strong endowment for the long-term development of the U.S. Young Astronaut Program, and by helping other nations to embark upon similar programs, the Young Astronaut Council may help in building a more aggressive constituency for space exploration and development. Doubtless, a more and more technologically knowledgeable population will be required to enable us to develop human capabilities both on and off the Earth. The Young Astronaut Program benefits our children, our teachers; our industries, and our world. By the next decade, there will never be a time without mankind in space. People in space­building, working, living, benefiting people on Earth-including former Young Astronauts. The Young Astronaut Program, like the Space Studies Institute, will be a significant catalyst in making this become a reality.